Mark Dean’s film Greta Garbo (1905-1990) is based on original source material – the screen tests for a film that was never realised. Dean’s film is on the borderline between a documentary and a performance starring Garbo. 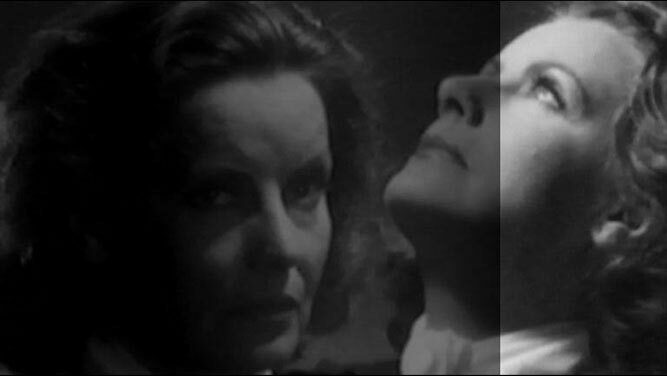 In fact, the artist selected a sequence on the basis of which he created two loops, one 1905 frames long, the other 1990 (corresponding to the years of Garbo’s birth and death). The film is black and white, and silent, without beginning or end. Its essence is attractive; a middle-aged actress of melancholic beauty once again challenges the screen. The picture is based on an asynchronous mirror, which creates two images of Garbo’s distinctive profile. Turned three-quarters towards both herself and the audience, it gracefully rises and falls, sometimes slowly, sometimes quickly. The divine Greta seems to be younger and younger, looking up into the sky and space as if with hope, exposing her potential for beauty, thus becoming completely elusive. When she hangs her head, we see fear in her eyes; she seems to be older, and conscious of her shortcomings. Dean’s film can be divided vertically, where both Gretas interchange their parts in presenting perfection, and horizontally, where Greta belongs to, by turns, the earthly or divine sphere. The duality of life and death includes a transient state towards which the actress seems to gravitate, by this I mean immortality. We are attracted by her image; seductive and obsessive, it almost takes possession of us. Greta needs Greta to maintain her trance; she exists, playing her last and never ending role. In Dean’s film, the initiation can be fulfilled only through complete submission to the phenomenon of adoration.